With a wooden spoon, beat the soft butter and cottage cheese together in a bowl until smooth. Add the flour and baking powder, and knead to make a soft dough. 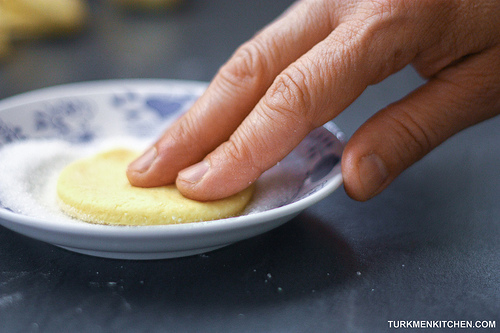 Roll the dough between your palms into a ball, then roll it out with a rolling pin to a thickness of 5-6 mm. Using a glass or cookie cutter measuring about 8 cm in diameter, cut out as many circles as possible. Gather any leftover dough and repeat the process. Preheat the oven to 180°C (356°F). Pour the sugar onto a flat plate. 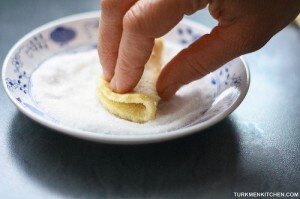 Gently press one side of the circle of dough into the sugar. 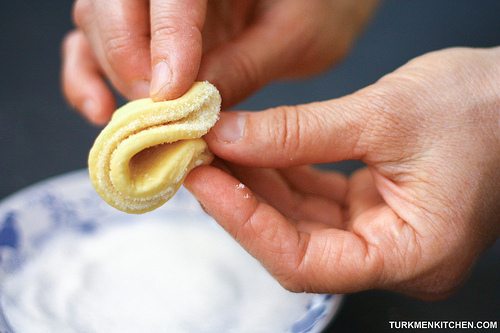 With the sugar-coated side always facing inwards, fold the circle in half. 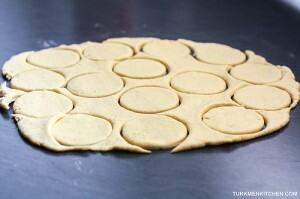 Press the semicircled dough into the sugar and fold the dough in half again to form a triangular shape. Repeat with the rest of the dough. Place the cookies on a baking sheet lined with parchment paper, spacing them about 2 cm apart. Bake on the middle rack of the oven until the cookies are golden, about 35 minutes. These look great :). 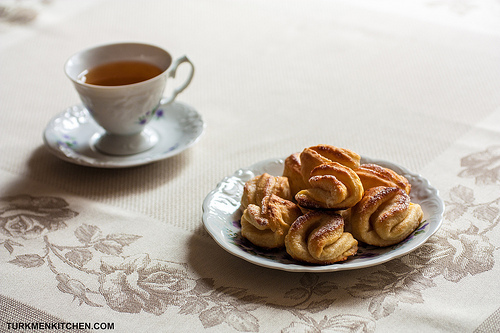 What kind of tea is typically served in Turkmenistan? I have to try these!! So many of our foods are similar! I blog about (mostly) Russian and Ukrainian food. I’m loving your blog! I made these and added vanilla to the sugar; they tested wonderful. Thanks for sharing the recipe. So I have to make a Turkmen food for a class and my teacher is super crazy about ethnicity so would I be able to use this food saying it is from Turkmenistan? I saw the comment about it being from Russia so I am a bit confused. 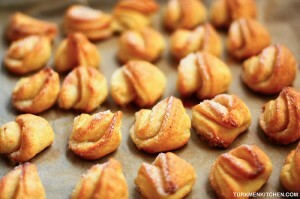 People in Turkmenistan do make these, but they are considered Russian cookies. For something really Turkmen, I recommend Kulche (Sweet Milk Bread) or Pishme (Fried Dough Treats). Good luck! How long can we keep this, at room temperature I mean? I want to give it as present to a friend so wanna make sure the cookies stay fresh. Also are they very delicate? I’d say 3-4 days. And no, they’re not that delicate. Hope your friend likes them! I haven’t tried but I think they’ll be fine. These were at hit at my small college in Nebraska, USA. The student from Turkmenistan actually put the lid on the container and took them to his dorm room. You should have seen the look on his face when he took his first bite.